With the new 2012 Focus - available as a sedan or hatchback in the U.S. - Ford's intent is not just to match the appeal of Honda, Toyota and VW, but to exceed it with leading fuel economy, technology never seen before in the segment, top driving qualities and craftsmanship, as well as safety innovations. The redesigned Ford Focus will offer features found in larger, more expensive vehicles because an increasing number of buyers are coming from those segments. Traffic information, WiFi, active park assist and a rear-mounted camera are some of the new technology features Ford says will separate Focus from the competition. Ford also will tout its new direct-injection, four-cylinder engine; dual clutch automatic transmission; fuel economy estimated at 40 mpg on the highway; and the car's stiff body structure, engineered to improve ride and handling. The intent is “not just to match the appeal of Honda, Toyota and VW but to exceed it with leading fuel economy, technology never seen before in this segment, top driving qualities and craftsmanship and safety innovations,” said Derrick Kuzak, Ford's group vice president of global product development. Kuzak said Ford is not abandoning value-minded shoppers: “The new Focus covers the low as well as the higher price range.” The vehicle's content is being expanded to reach buyers who demand more features, he said, speaking at a preview this month at Ford headquarters in Dearborn, Mich. The redesigned 2012 Focus will be unveiled Thursday at the Paris auto show. U.S. sales begin early next year. The car is aimed at the growing C-segment, composed of vehicles such as the Chevrolet Cruze, Honda Civic, Toyota Corolla and Volkswagen Golf. Ford sold 120,666 Focus vehicles through August, a 3 percent increase over 2009. In 2009, 160,433 cars were sold, an 18 percent drop from 2008. Mark Kaufman, Ford car marketing manager, said C segment growth is coming from unexpected buyers -- the owners of SUVs, full-sized trucks and premium brand cars. “The research surprised us,” said Kaufman. “These customers are used to a wide range of features and technology. Just because the C segment does not offer them today, we really spent a lot of time realizing that we will have to stretch and reach more because these people are used to a different level of equipment,” Kaufman said. For example, a new option on the Focus is active-park assist. The system can parallel park the car in 24 seconds. A rear-mounted camera also is available. MyFord in the Focus uses an eight-inch screen, the same size as Ford's more premium vehicles. “There is no reason why a C segment can't offer the same technology levels that are consistent on other vehicles,” Kaufman said. Sync was first introduced by Ford on the Focus three years ago. Since then, over 3 million Ford Motor Co. vehicles have been sold with Sync. This new generation of Sync has toggle switches on the steering wheel to activate the system. Additionally, voice recognition to operate the system is improved. The system also has text-to-voice capability. Kaufman said 32 percent of previous Sync buyers said Sync was an option that was critical in their purchase of a Ford Motor Co. vehicle. “We have to continue to keep moving technology forward. You can't stand still,” Kaufman said. The Focus will be sold globally, although the model lineup will vary by region. For example, the U.S. line initially will consist of a four-door sedan and five-door hatchback. A performance model called the ST and an electric-powered vehicle are planned for 2012. But the sedan will not be offered in Europe. A wagon model will be offered along with the hatchback. The car's shape is seven percent more aerodynamic than the 2011 model, for example. An available grille features electrically operated shutters that slightly improves fuel economy. The shutters are closed at high speed and open at lower speeds to improve cooling. The Focus has more high strength steel than any other vehicle the automaker currently produces, Ford said. Specifically, the structure is composed of 55 percent high-strength and ultra-high strength steel, which the automaker says is stronger and lighter weight than mild steel. The body structure is 30 percent stiffer than its predecessor, Ford says. The end result is better driving dynamics and improved noise, vibration and harshness control. 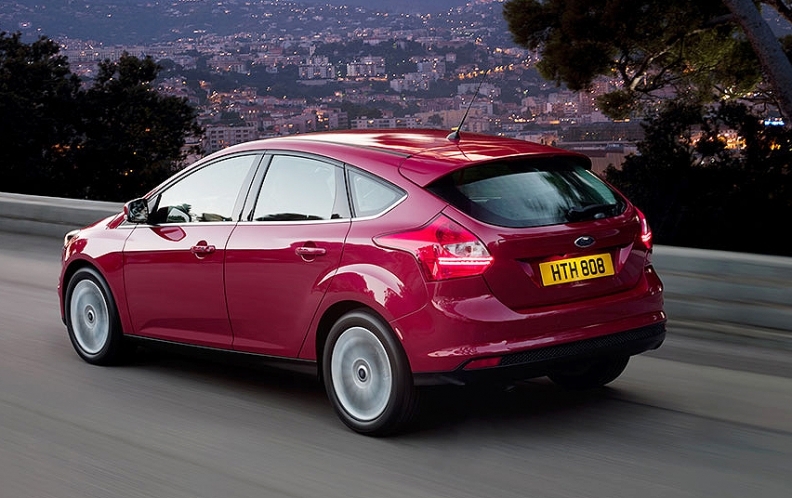 The new Focus also marks the introduction of Ford's most advanced naturally aspirated four-cylinder engine. The 2.0-liter engine features direct injection and has twin independent variable camshaft timing that provides better fuel economy and performance than the previous Focus engine. The engine has an estimated 155 hp and 140 pounds feet of torque, and it is standard on all models, as is electric power steering.